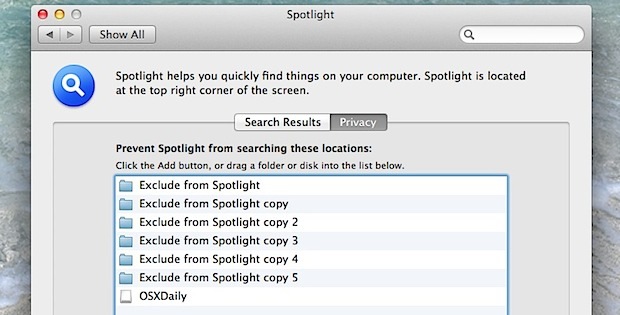 Spotlight is a wonderful feature of Mac OS X that lets you quickly find literally anything on a Mac by search, that includes files, apps, folders, emails, you name it, and Spotlight will find it, but sometimes you don’t want everything to be indexed. Whether that’s an external backup drive, a scratch disk, a directory of temporary items, or just a private folder with files you don’t want easily found through the search function, you’ll find that excluding drives, files, and directories from Spotlight is actually very easy. Whatever folder or drive in that list is effectively hidden from the Spotlight index, making the contents not be indexed, and not appear in any file searches, whether it’s from the primary Command+Spacebar Spotlight menu, or Finder-window searches. 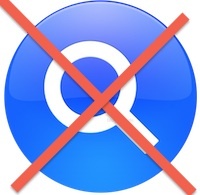 This is a much better approach than disabling Spotlight if all you want to do is hide certain files from prying eyes. Additionally, if you don’t want Spotlight to run when you plug in an external hard drive, you can just add it to that list to have it not be indexed (of course, that means it won’t be searchable with Spotlight though too). If at any point you want these items to be reindexed and reincluded within Spotlights search results, all you need to do is highlight them in the privacy tab and delete them with the Delete key or by hitting the “-” minus button in the lower left. Removing items will trigger the mds and mdworker processes to run again, and when finished the once excluded files will be searchable in Mac OS X again. 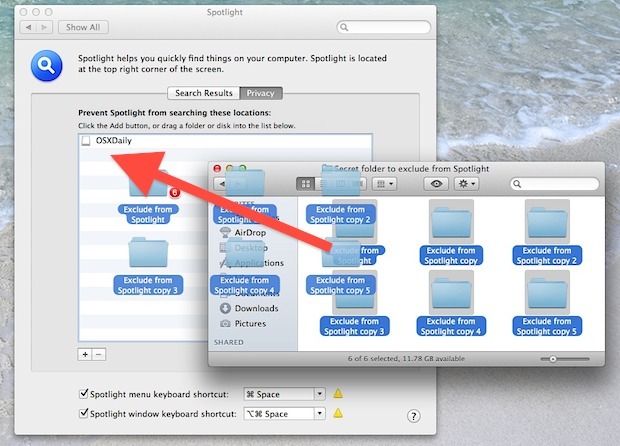 On a side note, because excluding items and then reincluding them also causes that directory or drive to be completely reindexed, this can be a helpful troubleshooting tip if you’re running into location specific problems with Spotlight, particularly if you find a file or folder isn’t showing up when it should be. Thanks. I hated having duplicate items from my back-up. Great – now I understand how to exclude folders from getting indexed. Thanks. So basically all someone has to do to see your “hidden” files is go into the spotlight preferences and see which folders are excluded from the search and double click on them. Is there another way to do this? ?